Saucony's marketing pitch: Plushest, most cushioned experience they've ever created. Upper: Mesh, synthetic leather, fused overlays, molded plastic counter. 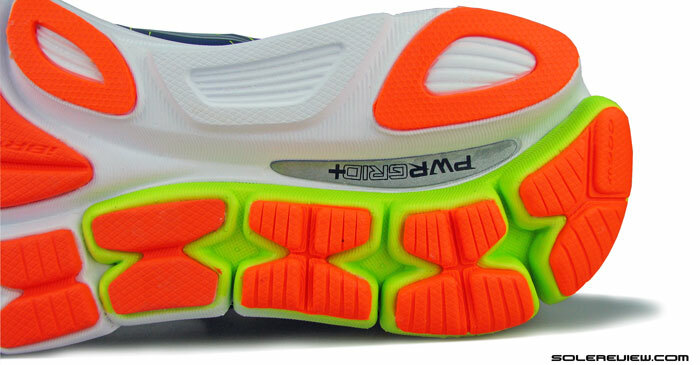 Midsole: Combination of compression and injection molded dual-density EVA foam. 8mm heel drop. 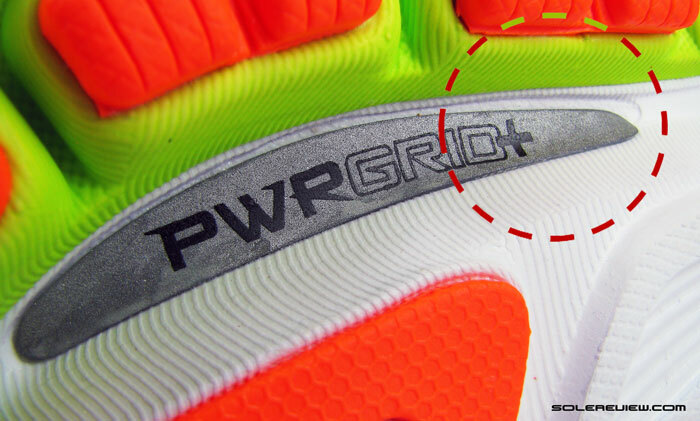 Outsole: Carbon rubber in heel, blown rubber under forefoot. Saucony's premium neutral trainer goes through sweeping design changes, most of it taking place on the upper. 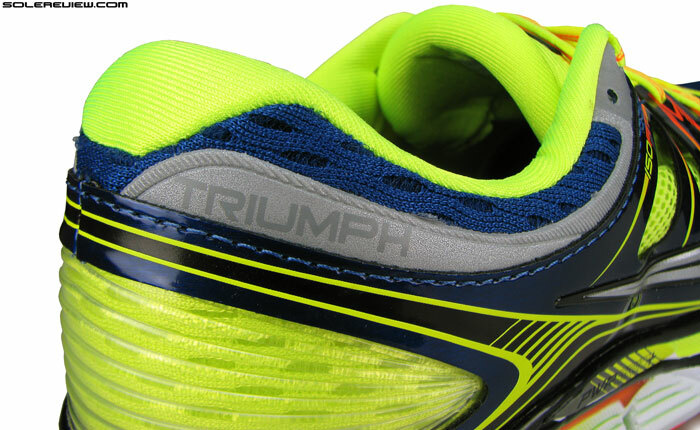 The Triumph ISO has an excellent upper fit, yet it is not as cushioned and plush as one would expect it to be. Everyone (well, almost) is trying new things, and that’s good news. Recently, brands seem to have snapped out of their temporary phase of design inertia, churning out model updates with a newfound ferocity. adidas continues to build on the Boost momentum, Nike’s doing their thing with the new Pegasus/Structure/Lunarglide and Flyknits; and Brooks has thrown some of their older ideas out of the room, for better or worse. Ok, same-old, same-old Asics is an exception, but come next year, and many of their shoes will follow in industry footsteps. Hoka, a goofy sounding brand from Europe continues to disrupt the status quo with a huge cushioning lever, greatly influencing the state of affairs in the running shoe game. It’s an European redux in a way, with memories of Vibram leading the minimalist charge not very long ago. Saucony is upping its ante too. Ride 7, a $120 cushioned neutral was impressive, finding favors with many. Their Kinvaras are going strong too, the latest refresh increasing cushioning levels of the low drop offering. Just a month ago, Saucony released the latest version of the Triumph following a period of low key PR and pre-release teaser campaigns. The marque technology is the new ‘ISOFIT’ construction, along with claimed enhancements to its cushioning platform. Saucony says their new shoe is ‘WHOA’. We put that claim to test. Shoe reviews are fun to do when there’s a lot to talk about, and the new Triumph ISO doesn’t disappoint. The last version we reviewed was the Triumph 9 a few years ago, and we weren’t particularly impressed. It was a good shoe, no doubt, but somehow it didn’t work out in our case. Compared to the 2011 version, the new shoe is a thorough reworking from ground up. It might be more helpful if we throw in a comparison with the best selling Ride 7. One might assume that ISO’s $30 premium would automatically make it a better shoe, but as it turns out, things are never that simple. Sure, there are areas in which the Triumph 12 betters the $120 model, but then the Ride 7 comes packing some ammo of its own. However, this isn’t the right place or time to dive deep into that discussion, we’d prefer to go over that once we’re done with the ISO as a standalone shoe. ISOFIT is Saucony’s new show in town. 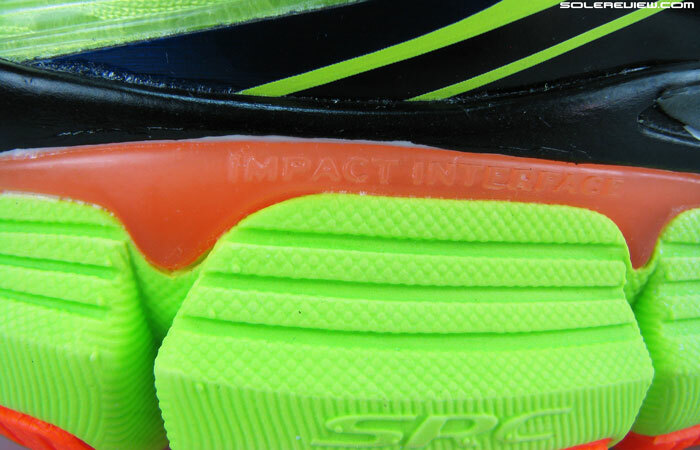 In its promo material, Saucony points out two areas where the Triumph ISO is supposed to excel in. There’s this new upper fit system called the ISOFIT, a construction template which appears to be the way forward for their premium models. The second claim is enhanced cushioning, with Sock-a-nee saying things like ’the plushest, most cushioned Triumph ever created’. Does all this newness turn out to be as good as it sounds? In one word, yes. The upper fit does what it sets out to do, and the new midsole is certainly cushioned, but with a caveat – an explanation of which would require the Ride 7 to be involved. And like most shoes, the Triumph ISO comes with areas for improvement, something which we’ll talk about after the good news is done and dealt with. Synthetic leather panels over an full upper sleeve – that forms the basic ISOFIT structure. Start from the top, and that shall be the ISOFIT upper. If one cuts through the flowery marketing jargons and strip down to fundamentals, it translates into floating synthetic side panels over an inner sleeve, with plenty of upper padding joining the party. We’ll cover each component in detail in our expanded upper breakout. Pass the lacing through these (four) independent eyelets, and that results in a secure midfoot lockdown – that is the basic premise of this design. Forefoot (and external heel collar) uses a thick, squishy spacer mesh. Tongue top lining is a semi-oval component with soft mesh, reminiscent of Kinvara 5. 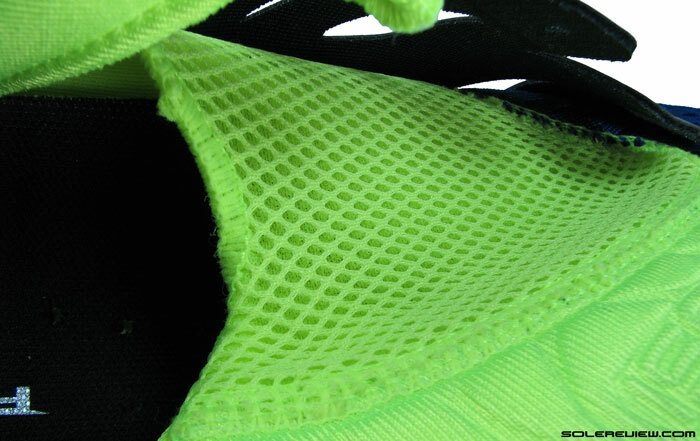 Triumph ISO uses a full mesh sleeve made of four different fabrics. The mesh on midfoot sides is a spongy spacer mesh with smooth lining. The midfoot panels are seam connected to the forefoot mesh, which is plush and padded with large pored structure. Tongue center has a funnel shaped design, the top part being wide and then progressively becoming narrower towards the front. The reverse side of tongue has two lining meshes, a blue strip running along the center and another at the top. Tongue center is funnel shaped, and with molded details. Collar uses the moisture wicking RunDry fabric. Same lining used across collar and tongue top. The funnel shaped tongue has molded details on top, a treatment which you don’t see often. 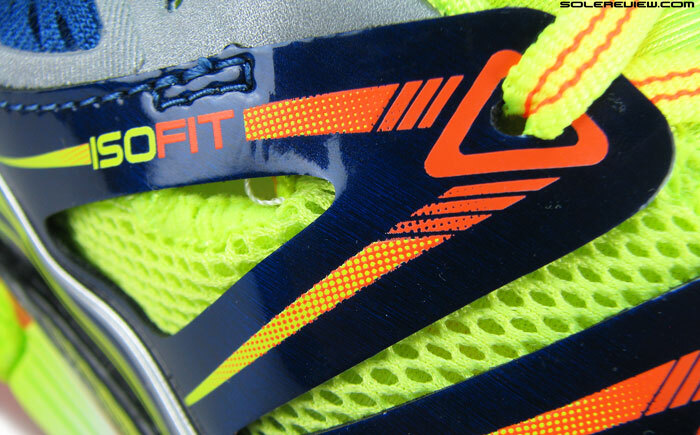 Remove the lacing, and the text ‘ISOFIT’ is visibly molded on top, surrounded by other raised details. 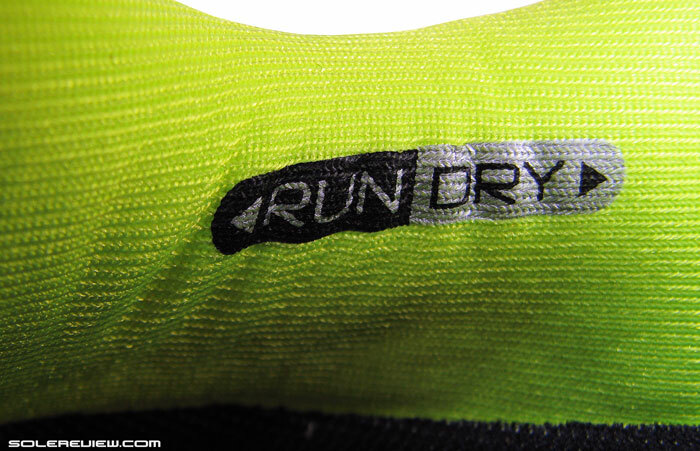 Collar and heel lining is built using the moisture wicking ‘Rundry’ fabric, which also forms part of the tongue. There’s a liberal level of foam packing inside those collar walls, and more so at the back where the upper meets the Achilles tendon. 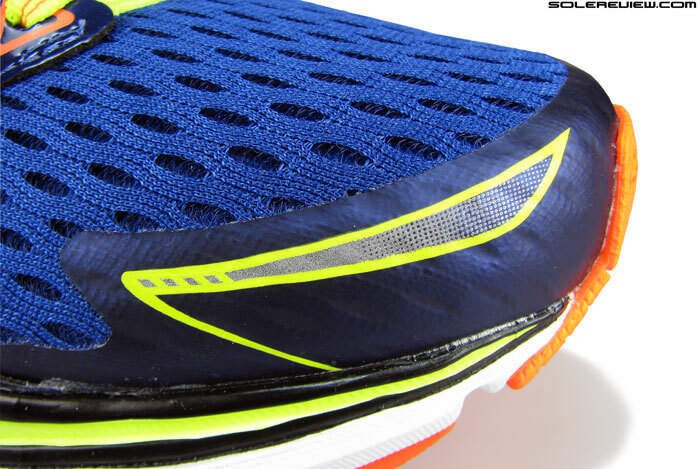 In a way, the Triumph ISO’s tongue top and collar treatment is akin to the Kinvara 5, with common design cues. 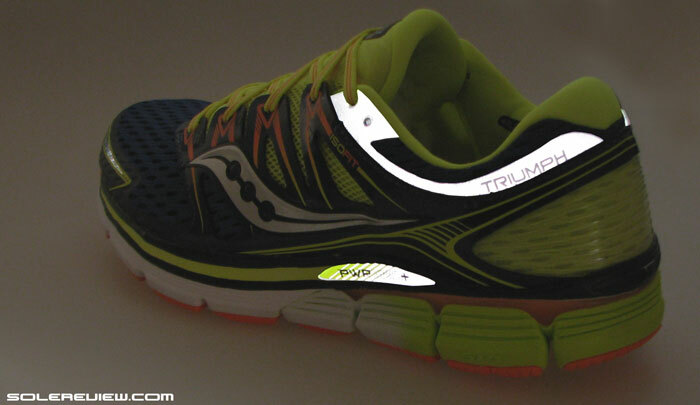 Triumph ISO’s ‘support frame’ is an external, transparent heel counter. Converging molded lines make for great cosmetic depth. External heel is reinforced with a transparent, molded plastic counter which is called the ‘support frame’. The spacer mesh underlay is visible beneath, and makes for a neat visual effect. The molding lines on the support frame adds aesthetic dimension, and looks novel since there isn’t much of a precedent in running shoes with transparent heel counters. The 2008 adidas Megabounce had a transparent half-heel, but other than that, the only parallel could be found in the motorcycle boots. Racing shoes like the Sidi Vertigo Corsa came with transparent heel overlays. Of course, we’re only talking aesthetics here, since functionally those shoes perform very differently. 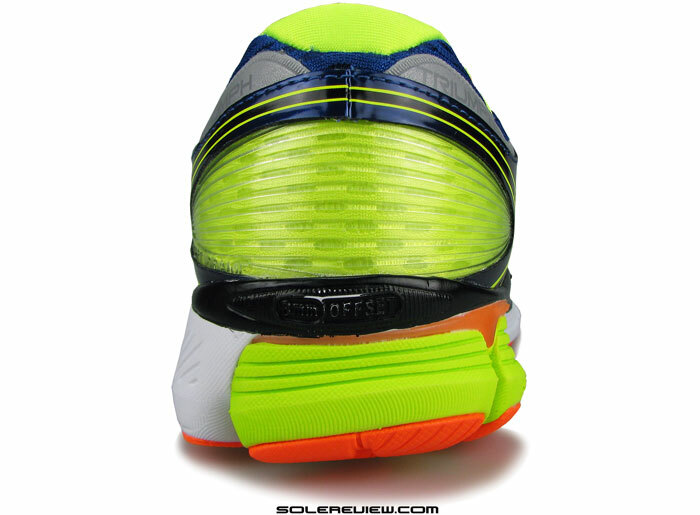 Top part of outside heel has the same mesh as the forefoot, creating an aesthetic tie-in and balance. 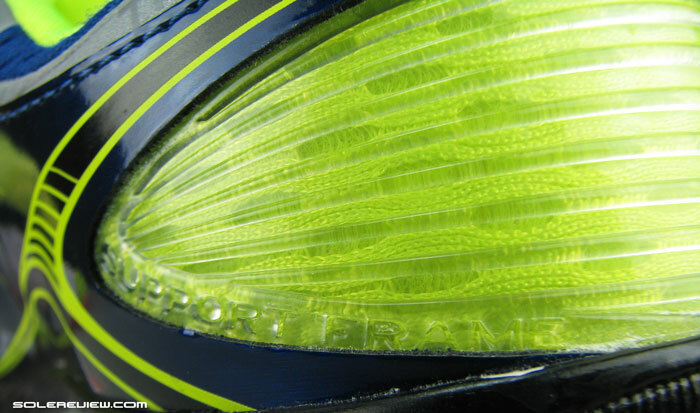 Reflective strips are fused on this part, with branding callouts on the side. Here’s looking at ISOFIT in its functional entirety. Panel extensions are clearly segmented, and lie flush over the tongue. Flat and semi-elastic laces are perfect for this set-up. 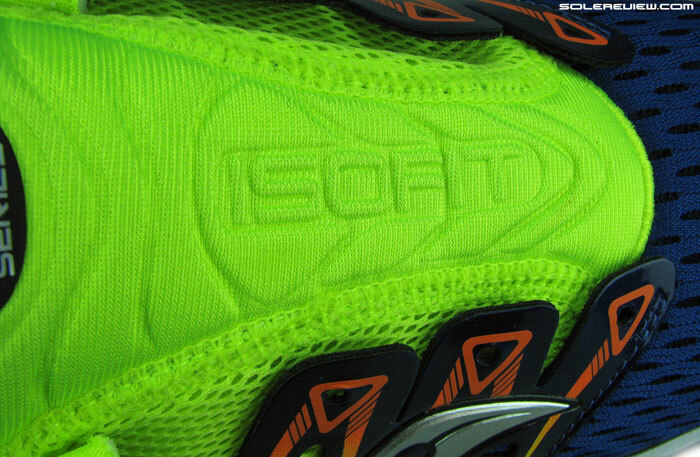 A floating synthetic panel works in conjunction with the inner sleeve, both of which when combined, form the ISOFIT. Like we briefly explained earlier, the design is very simple, really. Two large panels of glossy synthetic leather rise up on either sides, and they split into four different ‘fingers’ which then connect to the laces. The V-shaped openings between these fingers allow each of the latter a freedom of movement, with the last part (near tongue top) having maximum leeway. The idea is to have each of these section apply their own level of pressure, more localized than widespread. It also helps these sections sit flush over the tongue, connected by semi-elastic flat laces. Inner sleeve walls are spacer mesh panels, which also do a great job at insulating side pressure. And this upper design works. The Triumph ISO upper wraps the mid-foot in padded excellence, and does so with the support and comfort expected of it. Pressure feels secure and consistent, with the molded tongue top making short work of lacing pressure. If you’re used to Nike shoes with inner sleeves, then it will be useful to know that the Triumph ISO differs in one important way. Base of the sleeve is attached close to the midsole edge, unlike a Lunarglide 6 execution, where the sleeve comes attached a bit distanced from the edges. Forefoot fit hits a sweet spot, and toe box height is just right. This has the ISOFIT achieve what we feel is a delicate balance between snug and relaxed, and we say this as a compliment. Forefoot is snug but you still have splay room, with the molded toe bumper not restricting movement in any way. And if you feel the need for more space, then an option of a wide fit is also available. Toe box height has all the right dimensions, neither too shallow nor too high. There’s open area around the toe tips, though some runners might feel the Triumph ISO sizing to run slightly smaller. And why is that so? The ridiculously well padded Achilles area is soft to touch, but we think it pushes the foot slightly ahead. That would be the plush collar’s doing. The neoprene like mesh packed with foam goodness provides superlative grip around the Achilles, but we suspect the extra padding nudges the foot forward, marginally reducing toe-box room. From our experience, the ISO upper runs true to size, but still recommend potential buyers to first try and then decide sizing. If one uses the last eyelet, lacing would end up skimming the tongue edge. A slightly longer tongue would have been nice, for couple of reasons. One, if you end up using the last row of eyelets, doing so will have the laces end up on tip of the tongue. No slip was noticed due to the turned seam (bump) keeping the laces locked over, but a little more margin would have been comforting. Two, a shorter tongue results in a padding gap between the collar and tongue, the consequence of which is a could-be-improved collar fit on the sides. 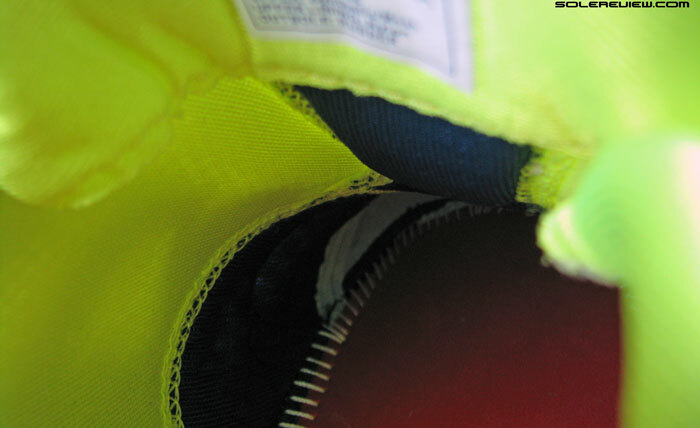 In the existing arrangement, there’s an absolute lack of insulation between the sock clad foot and lacing threaded through the last eyelet. 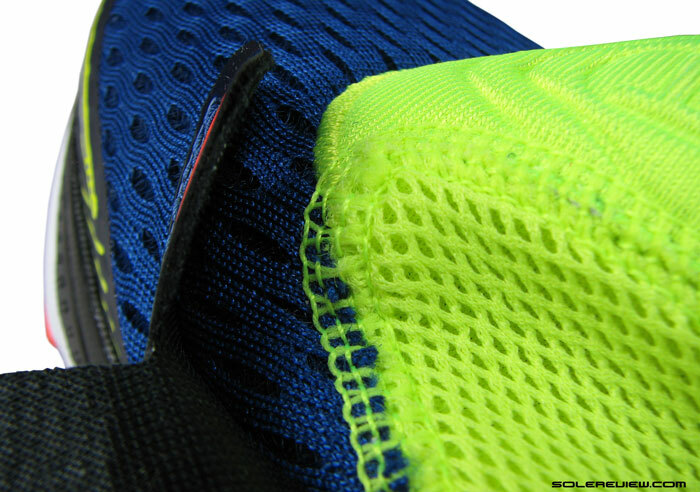 Midfoot sleeve panel is flat-lock stitched to forefoot mesh. However, the number of internal seams result in zero irritation. You can happily wear the shoe barefoot. But when viewed as an overall sum of parts, the upper scores highly on important functional aspects such as snug lockdown and comfort. Also, Triumph ISO is a go when you want to run without socks. There are a number of flat-lock seams inside the sleeve, but none get in the way. 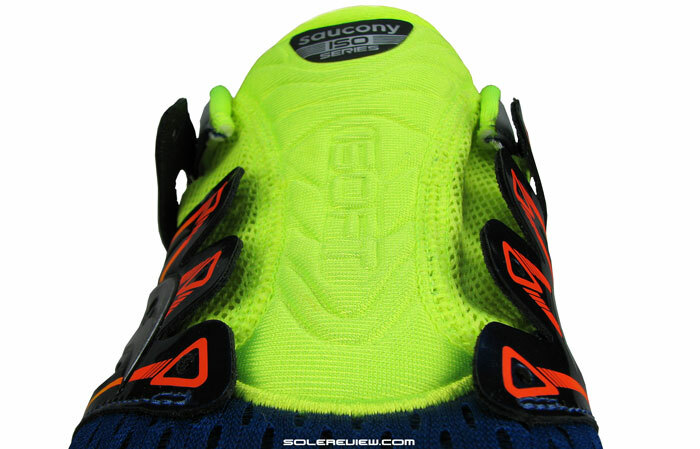 Saucony definitely has a win here with the new upper, and it will be great to see more of their shoes featuring ISOFIT. Simulated night-time visibility: Outsole (during runs). Living upto its tag as a bigger brother to the Ride 7, the 2015 Triumph comes assembled with multiple areas of reflectivity. There’re these two collar wraps which light up at night when the situation demands it, and a slender midsole overlay chips in too. 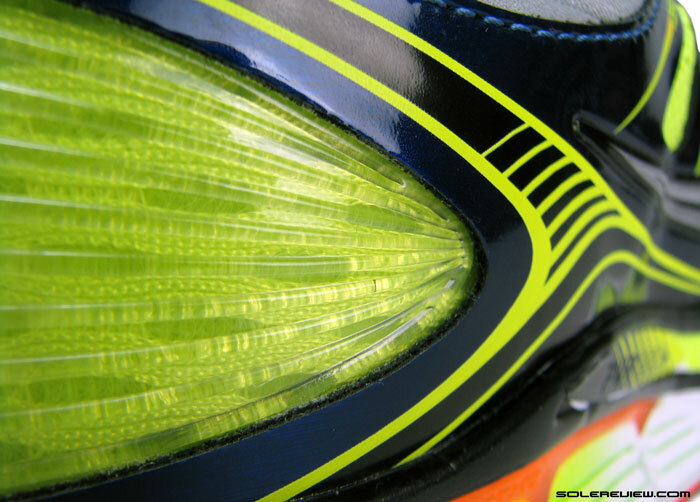 And like the Kinvara 5, the outsole also sports a visible strip, seen when light shines on it during motion. Our images above simulate how all of these bits look like at night. Triumph ISO’s new multi-tiered midsole: Does it live up to WHOA expectations? Carries forward (redesigned) components like the plastic ‘impact interface’ and SRC crash pad on lateral side. Much is being said by Saucony about the Triumph ISO’s cushioned ride. There’s no denying the fact that stack heights have been beefed up; there’s a 3 mm thickness increase in both rear and forefoot over previous generation Triumph 11. Midsole construction has a familiar look and feel, retaining the combination of a large primary midsole section, separate crash pad and a plastic stabilizer (called impact interface) over the lateral crash pad. 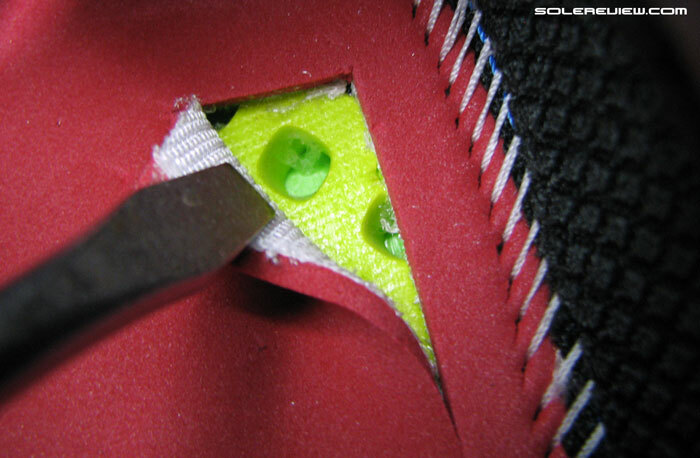 What’s missing is the plastic shank, which now has been replaced with a midsole foam fill – a trend seen in many running shoes, both within Saucony’s line and outside it. And you might not agree with what we’re going to say next, but here it comes – the shoe actually rides firm. We’re not saying that the shoe isn’t cushioned; the Triumph is padded, but with an unmistakable firm undertone. Here’s the thing – when brands say ‘plushest’ and ‘most cushioned’, it automatically sets up a virtual sparring match with a shoe like the Hoka Clifton. 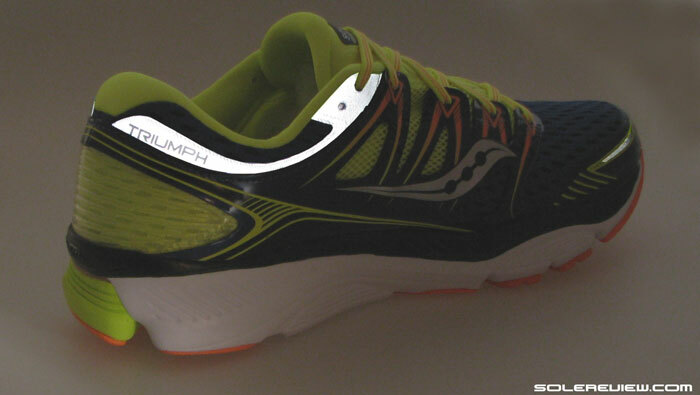 We also found the Saucony Ride 7 to run softer than the Triumph ISO, which to us was a genuine, unexpected surprise. We wouldn’t make a statement like that unless we were absolutely certain of the reason(s). For a clearer explanation, it is imperative that we bring the Ride 7 into the picture, so we’ll do exactly that. Saucony says the Triumph ISO employs ‘Powergrid+’. And what might that be? Triumph ISO claims to use ‘Powergrid+’ cushioning, and ironically this ‘+’ version ends up being the biggest contributor to the relatively firm ride. 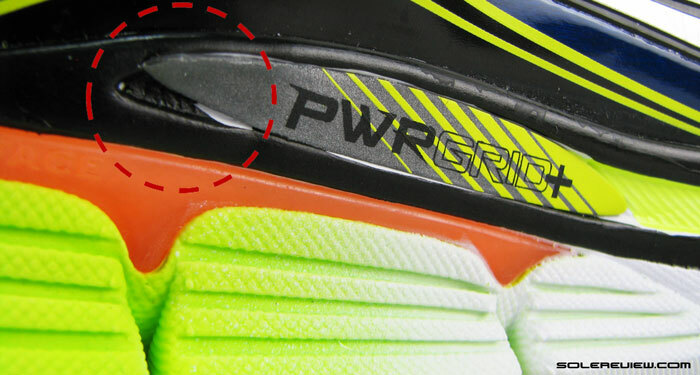 For long, the Powergrid system has involved using a second layer of perforated foam between the strobel (insole) and midsole. This made landings soft yet responsive, as the Grid layer compressed independently in relation to rest of the midsole. Even the Kinvara has it, although not in a full length version which the Ride 7 came with. The ‘+’ means that Saucony has removed the separate foam layer and simply proceeded with molding some depressions into the main Triumph midsole. This is from inside a 2015 Guide 8, and how an actual Powergrid insert looks like. 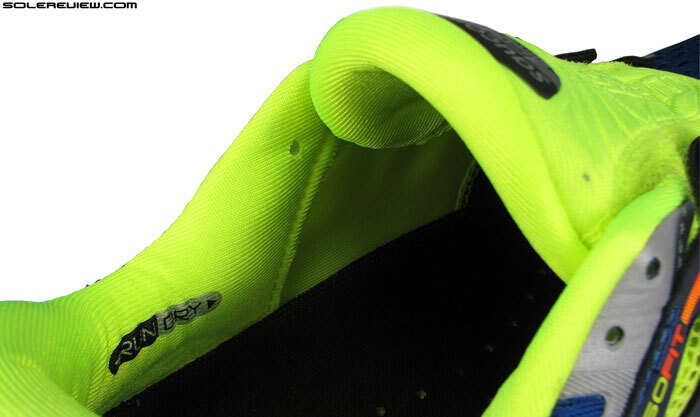 Note that it is a separate layer atop the regular (darker green) midsole. 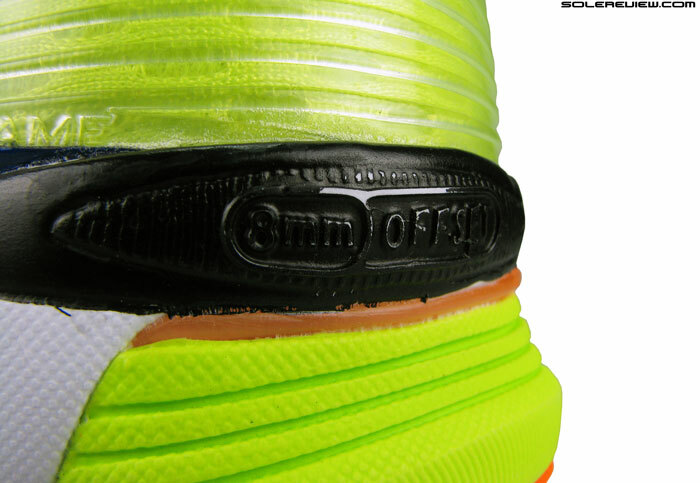 However, the Triumph ISO does not make use of the additional midsole layer. All it does is simply punch some square shaped depressions in the primary midsole layer, and that’s that. Like we said, we are absolutely sure of this – and the image above is proof of that. Note how the ‘Grid’ is just a top texture, and is not another embed. We cut the strobel in a place where an injection molding screwhole is visible. The same material continues from top to bottom. Contrast this with the picture from inside a 2015 Guide 8, where you can actually see the grid as an independent overlay. It isn’t hard to guess what comes next from a ride perspective. There’s no initial layer of cushioning or responsiveness, and whatever cushioning exists comes from the combination of foam compression, including one from the crash pad with mounted outsole pods, removable insole and last but not the least, the splaying of outsole. In contrast, the Ride 7 might not have the stack height of Triumph, but feels softer with better feedback. This behavior was noted both with the sockliner and without it. 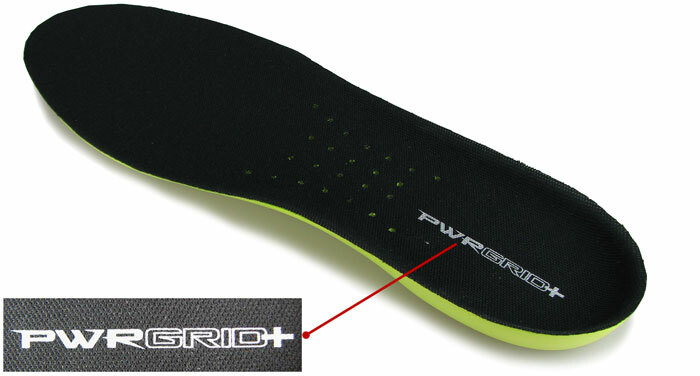 Triumph ISO has a firmer insole than the Ride 7. And yes, the sockliner, that’s another area. The Triumph ISO uses a slightly firmer (than Ride 7) insole, so that also adds to the firmness in ride. We don’t think that the plastic ‘impact interface’ insert makes a difference. It is after all, only limited to the lateral fringe, and does not come directly under the foot. So know that when Saucony says things like ‘most cushioned and plushest’, it is with reference to previous versions of Triumph. This is far from an industry standard for a cushioned ride, so expectations need to be managed. 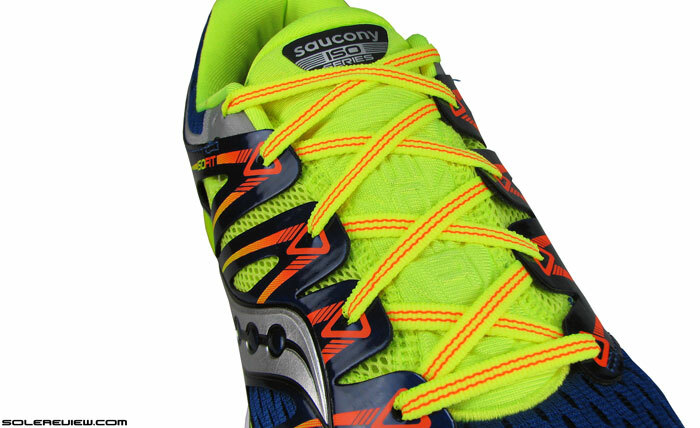 We did not test last year’s Triumph 11, but Saucony described the midsole to be ‘made entirely of Powergrid’. We assume that the 2013 Triumph also came with the ’new’ grid design. Not sure why the older Powergrid disappeared on the newer Triumphs, it makes little sense. We also noticed that Saucony has sneakily changed the earlier Powergrid graphic to this lean ‘+’ version in all of their product descriptions. This (incorrectly) applies to even the ones which do not feature the ‘+’ construction, like the Guide 8 and Ride 7 for example. This might indicate that future models might come only with the ‘Powergrid+’ version. Definitely a sign of cost cutting across. Anyway, Saucony has strayed so far away from the original Powergrid concept, it’s pointless to warrant a comparison. It’s like Brooks pulling a ‘SuperDNA’ on some of their recent updates. This is what most brands do – start with a brand new technology and then water it down as the years go by. Nike Flywire is another stellar specimen of the said dilution. Full contact outsole, with forefoot flare helping stability. Stability is great on the new Triumph, and so is transition. There’s ample heel and forefoot flare, making for a solid base underfoot. The shoe also maintains a very neutral behavior, without excessive lateral bias. The molded stabiliser over the lateral crash pad prevents the heel from leaning too much towards the outside. Heel to toe weight loading is smooth, with the full ground contact outsole doing its bit. 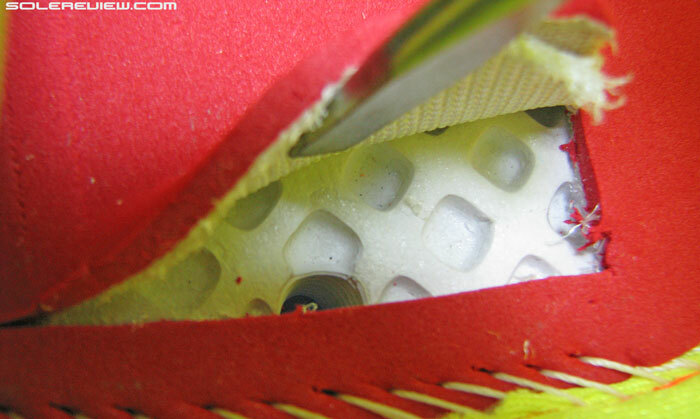 Heel outsole is mounted on raised midsole pods, and midfoot area is filled up with foam. XT 900 rubber used in the back is durable. 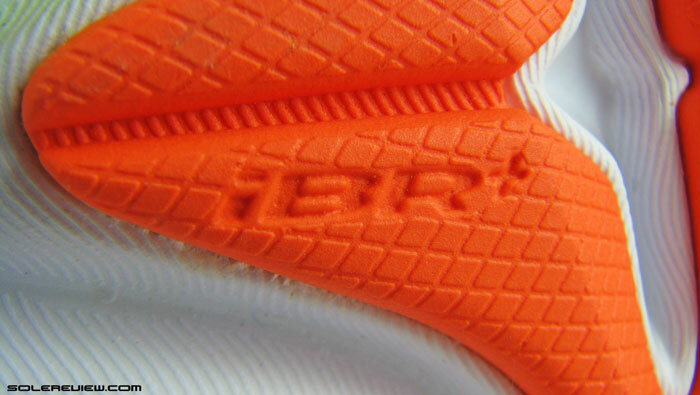 Forefoot uses a softer variety of rubber, in this case iBR or blown rubber. Outsole rubber placement is contemporary Saucony design. Blown rubber covers the forefoot area, and hard wearing carbon rubber protects the heel from accelerated wear. The heel rubber is indeed hardy, as not much wear was seen even after multiple days of wear-testing the Triumph ISO. Major fitting problem – the reflective piece is misaligned with the groove it’s supposed to sit in. 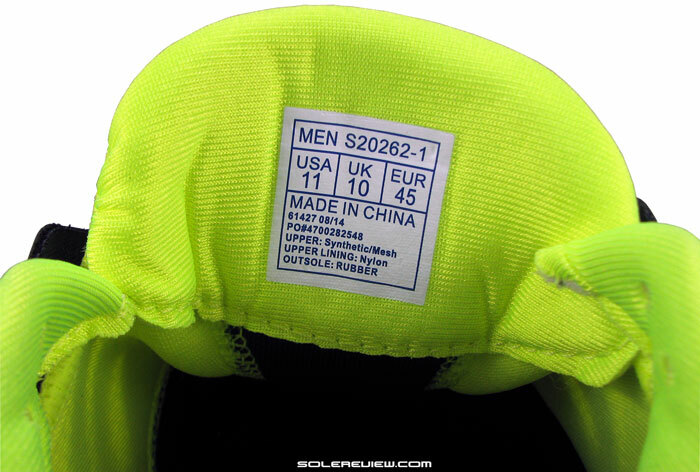 Same problem on the outsole too. Look at the dark blue piece of synthetic leather. The right one extends right upto the heel, the left side stops way before. Midsole paint was already peeling off. Component fitting and finish is an area which could do with serious improvement. The reflective strips on the midsole and outsole were haphazardly stuck on, the component majorly misaligned with the groove it is supposed to sit flush with. Upper patterns on heel area are also out of place – see the image in which you can clearly see the lack of symmetry. This did not affect the fit, but certainly has the potential to influence in some cases. The black midsole paint is also flaky, already seen peeling off on the back part of heel. Is it worth upgrading from a previous version of the Triumph? As far as cushioning is concerned, can’t say for sure, because we haven’t reviewed the T-11. However, upper updates are huge and for that reason alone, it might be worth considering buying the Triumph ISO. What do we think of a Ride 7 to ISO upgrade? To answer that question, we’ll simply lay out the facts and then the informed decision is for you to take. Triumph ISO’s greatest strength is its upper, and performs much better over the tongue sliding Ride 7. That’s what you get by paying $30 more. The ISO upper also looks striking, but that is purely a subjective play. The Ride 7 does better on weight, coming in a full one ounce lower than the Triumph. It is also more ventilated, as the midfoot wrapping ISOFIT overlays makes the Triumph upper slightly warmer in comparison. Don’t get us wrong. 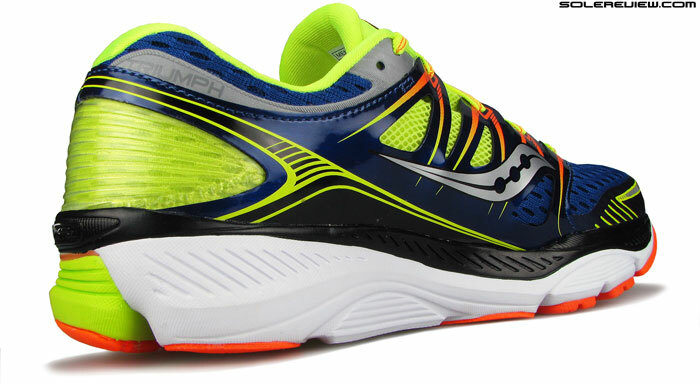 The Triumph is a very good shoe with more than adequate cushioning, stability, and a visual beaut of an upper. It is just that it doesn’t feel as immersive or engaging as it should. Ground feedback feels muffled by the extra stack heights, and after tasting blood on the Cliftons, the cushioning experience feels second rung. The key to enjoying the new Triumph ISO lies in managing expectations. The review is spot on. I wore a size 10 wide in the Triumph 9 and had to size up to a size 11 wide in the Triumph iso. The forefoot seemed a little too snug for me though and I wasn´t impressed with the cushioning – not responsive enough. A bit relieved to hear you’re on the same page! Thought we were the only ones who felt the Triumph’s cushioning wasn’t Whoa enough. Exactly our impression of the ISO. Thanks for another great review. I enjoy how you get into the nitty-gritty of the shoe and don’t just rehash the shoe company talking points. I was surprised by the statement that the Ride 7 is softer than the new Triumph. Perhaps if I ran in them side by side I’d come to the same conclusion. I’ve ran in the Ride 7 a couple of times months ago, but got a great big blister so returned them. I have however put many miles on the Triumph 10, and some on the 9 & 11, I felt that the ISO version is softer than them all. How does the ISO compare to the Adidas Energy Boost in softness and responsiveness? I’m considering buying the Adidas. Appreciate your diligent effort in helping us runners make informed decisions in our shoe buying process. It really helps! You’re welcome, and really, all these comments are great motivation to keep solereview going. So thank you! Yes, the difference in cushioning quality is noticeable (between Ride and ISO) if you alternate between them. That’s because of the couple of reasons we detailed in our review. Compared to the Triumph 9 (that’s the last we tried), the ISO is definitely softer, agree with you on that one. adidas Boost is in another league altogether, as far as softness and responsiveness is concerned. The ISO has nothing on it. Thanks. I really think I’m going to give the Adidas Energy Boost a shot. Exactly, that is what the new ‘+’ thing is. The Guide 8 retains the separate layer, like the 7. Our review will be up sometime this month. Happy to hear our work being appreciated, it means a lot! Your work is certainly appreciated…being a heavier runner (6’6′ 250) with an uncommon shoe size (15-16), and advancing in age(39). I have to choose wisely or risk injury. Your reviews have helped me avoid a few shoes that wouldn’t have worked for me at all although the “marketing” has said otherwise. Hoping the Guide 8 proves to be a good shoe. The Guide 8 is a good sort, based on first impressions. Unless something negative crops up between now and later this month, when the review gets published. Great review. One topic I would like to get your advise on: I am running with Asics GT3000 which offers me a late gait overpronation protection. That is a feature I have trouble to find elsewhere except on the old Adidas Salvation. Any hints on which model could offer similar features? Thanks and keep providing those very thorouh reviews – very insightful! Hi Manolo, we would have to disappoint you – haven’t tried either the GT 3’s or Salvation so don’t have a frame of reference to answer your question. Sorry about that! Im currently running with the NB 890v4 , have been running with the 890v2 before. I just find the 890v4 wears off way too quickly especially at the heel. Im considering changing my brand to saucony , perhaps the triumph ISO. Would you suggest the change? i do about 60km per week. Heel wear? Try the Nike Pegasus 31, it uses some really long lasting rubber. Otherwise the Ride 7 and Triumph do reasonably well on outsole durability. Should I consider buy this shoe, since I’m a flat and “weak” feet runner? Hi – what shoes have you liked in the past, ones which have had you running injury free? I of course read the review AFTER i made my purchase but pleased that I seem to have made a good choice. I was coming from many years of just upgrading to the newest Pegasus and most recently using Newton Distance. I tried the Ride 7 and the Kinvara because that was what the salesperson put in front of me. I saw the Triumph and and tried it out and felt it was a nice “in between” shoe of the other two. I was surprised to read the review and find that it was heavier than the Ride 7. Maybe the cushioning made it “feel” lighter to me. The fit was much nicer than the Ride 7 for me. I replace the insole with my custom orthotics so not sure how the “feedback” will work out. The ISO is a good shoe, and that is one of the reasons we gave it a 87% rating. 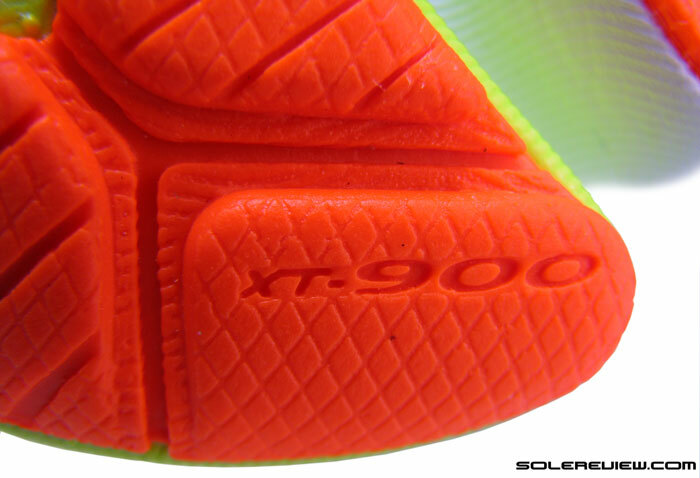 Perhaps the lack of layering inside the midsole (like the Ride 7) gave you the impression of it being lighter! wow – im so surprised to read this review. This is probably only one of a handful of reviews I’ve ever written about anything but felt I needed to add my opinion what I consider to be the best pair of running shoes I have worn in 20 years. I was literally blown away when I put on the new Triumph ISOs. I have been running in Saucony Triumphs for the last 5 years and have had the Triumph 8s 9’s and 10’s . Recently after deciding to go for my first marathon, I went to the best running shop in London and got all kinds of tests done and ultimately ended up buying a set of Saucony Ride 7’s and I haven’t really got on with them, they feel hard under my feet, and don’t seem to be so forgiving on longer runs and I got blisters on one run and so pretty much continued to opt to run in the old Truimph 10s. Anyway fast forward another couple of hundred training miles and I realised that I would need some shoes for the Marathon and the ride7s weren’t gonna cut it so I bought some of these ISOs and I havent been so excited about a pair of trainers since I got my first set of Nike Air Max when I was a 12 year old kid (I realise those aren’t running shoes but they were the “must-have’s” in the early 90s!!). In short, these ISOs are the most amazing feeling shoes I’ve ever worn and a class away from the ride 7. They feel so soft, so responsive and there is something like I’ve never felt with the grip on the bottom, its like they have some next level grip or something – all round they just feel like a large step into the future for me and I went and bought another pair this weekend on ebay, cos they are just amazing. Great to read about your excellent experience with the Triumph ISO, helps others too. Thanks for sharing! Thumbs up to everything you said about the Triumph ISO! Bought these back in November and they are the best running shoe I have ever purchased. Best fit, best quality of cushioning. I’ve probably bought around 30 different shoes from Altra’s to Hoka’s, to Brooks and Mizuno’s and Asics, and everything in between, but like these the best! I wanted to love this shoe. I ran 12 miles today training for the Boston Marathon and I had to stop a few times to adjust the laces. Just couldn’t get it right. It was either too loose or too tight. Also, I didn’t feel like the shoe gave a lot on the long run. It was just too stiff for me. I ended up taking them back to the running store and the gal who worked there felt the same way as I did. Saucony made a good looking shoe with a great marketing campaign. I went back to the Brooks Ghost. Although boring, it is tried and true. Thank you for your review. You confirmed what I was feeling when running in these shoes. Thank you for sharing your feedback – we had a similar read on the midsole. Good luck with Boston next month! Here is my honest opinion. I bought this shoe once, returned it, and bought it again and returned it again. I wanted to love the shoe but I have never been mid-run and wanted to take a shoe off so badly in my life. Literally made my foot feel like someone was stabbing it under the balls of my feet below the big toe, on the inside edge. I had the worst blood blisters I’ve ever had when I took them off after a 12 mile run last week. The first time I thought it was because the shoe was too narrow and because I had been running in the middle of winter it was only on the treadmill.. Then i got my same size in a 2e width. The toe box was plenty roomy and it still happened. My first observation on these shoes was that it was very slappy for me against the pavement. Signal #1 that the shoe wasnt working for my foot. It also felt like it was absorbing my energy and not transferring it back up my leg. And finally the blood blister issue which I have never had on another shoe, and for the life of me couldnt figure out. I run 60-70 miles a week and really need a plush neutral shoe and didnt have the time to see if this would break in and get better, so I had to get rid of it, twice. Love the upper and the way it hugs my foot. Love the color scheme and the looks even more. I love the semi-elastic laces. I love the burrito style wrap of the tongue. But running in them was just the worst experience I have ever had in a shoe. Unfortunately I have no idea what kind of super-cushy trainer to get now, because everyone I know has recommended this shoe to me. That’s a downer. Another example of how complex running shoe compatibility can be. Thank you for sharing your thoughts. If you’re open to a lower drop shoe, then suggest the NB Boracay and the Asics 33M (heavy and slightly mushy). Our current recommended pick for a regular heel drop model would be the UA Speedform Gemini (snug forefoot). Is it possible that the smaller fit is causing the blister problem? I’ve been very comfortable with size 11 in Triumphs and felt a blister coming within the first 3 miles with the ISO. With the small feel, the arch support is pushed too far forward. It is possible. More often than not, the quality of fit is what causes blisters. YES!!!! I have the exact same problem with these shoes. I am sitting here staring at them as I write this. I don’t know what it is, as I’ve never had a blister from a running shoe, but anything over a couple miles and the burning sensation right on the edge of the ball of my foot starts right up. It’s a shame too because I really wanted to love these. I have since heard from the owner of my LRS that it is an issue that several people were having. He suggested cutting out the chunk of the last isofit overlay right where it connects to the midsole and that might alleviate the issue. This is true. The area where the arch and the big toe connect has a hot spot. 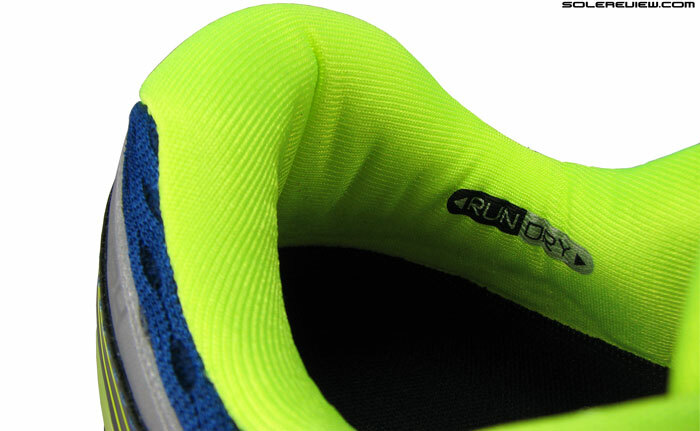 For some reason, the insole collapses there, making a crease that will rub that area consistently during your run. I really love the shoes and opted to cut that area off my insoles. Problem solved. Same problem. Annoyingly on such expensive trainers. How do you mean cut it out? 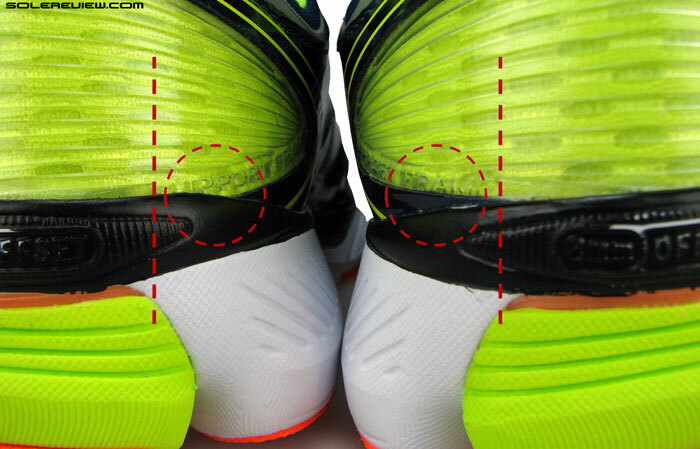 Cut the insole where the hot spot is? Any pics? I’ve got the same problem but only on right foot. Marathon training and anything over 10miles and I get a horrendous hotspot. Which bit are people cutting out? Is it the highest foam layer before the upper starts? Otherwise a really nice shoe. Could you please take a photo of the piece of the ISO overlay that you cut? I chose these because of a persistent bursitis injury on my heel and I wanted a cushioned ride which is what the reviews promised. I paid the equivalent of $209 USD in China (they’re even made in China!!) but I thought it was better to pay for for the shoes I wanted than to pay even more on physiotherapy bills. Went for a first run today and love them. Compared to the shoes I had been using, alternating Mizunos and Asics, the Sauconys initially felt softer on the inner heel but the feeling soon subsided. After an initial run I can report that these are a great shoe, comfortable, cushioning and particularly easy on the heel. I realize everyone has a different gait, weight, strike, etc but for me these are a definite winner. Yes, China is pretty expensive – and that’s true for all brands. Hi and thanks for the review. Currently I use Pegasus 31 for my weekly training. But i want to ask, not sure if the Triumph is the right model, but I’m planning on taking an almost a month long walking journey, with daily walks (yes, no running, but walking) of about 25-30 km per day. Do you see the Triumph as a suitable model, or should I look for a trail running shoe? Are those walks going to be on trails? If so, what kind of trails are they? Beaten tracks in the wood, macadam trails but not technical ones. For sure there will be also more rough tracks where a firmer shoe will be necessary, but tarmac roads will be predominant in my trip. Thank you. Any reason why you don’t wish to continue with the Pegasus 31? Excuse me for the late reply. I am very much happy with my Pegasus 31 for now. All I am asking is to get a clearer picture about the ride Triumph offers compared to Peg’s, performance on longer runs than my weekly training which is about 4-5 km. runs, and the above mention long daily walks. The other thing in my mind is to research for a trail shoe, i.e. all recommendations are welcome. Thank you! The Triumph is more cushioned than the Pegasus, and when we say cushioned, it does not mean soft. The midsole just feels deeper than the Pegasus, both in the heel and forefoot. Haven’t taken either of the shoes on mild trails, but assuming that the split up design of the Triumph outsole will perform better off road than the Pegasus. On road, we’d choose the Triumph ISO over the Pegasus if we had to do long runs. We don’t have review experience with trail specific shoes, so can’t help in that regard, sorry! Thank you! 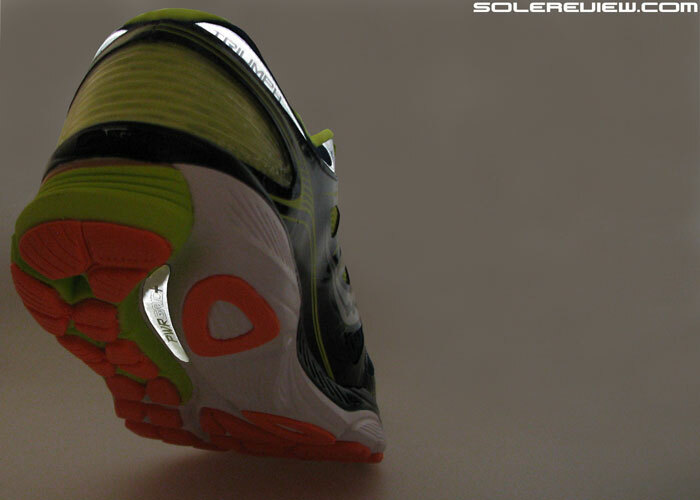 I am waiting for the review of Saucony Zealot and then will decide which way will I go. You’re welcome. The Zealot review will take some time, tentatively around end-June or early July. Hello. I ‘m looking for New Shoes. I’ m 1.80m tall and 78kg weight. My pace is about 5 miniuts per km. I’ m looking for some that give me stability in midfoot landing. What do you recomended me…. Triumph iso or Gliceryn12? Thank you very much. Out of the two? The Triumph ISO. What other Shoes do you recomended me? Adidas Supernova Glide Boost and UnderArmour Speedform Gemini are other good options to try and see. You could try the Glide 7 Boost, but we have a feeling the shoe isn’t the 100% cause of your knee pain. Any idea if you will give the edge to the Saucony Ride 8 over the Triumph ISO? Not sure yet, Trey. Our Ride 8 testing only begins end of June, with review within first half of July. You could check back then! I currently use the Triumph 11. Wondering if there’s much difference at all between the 11 & the new isofit range? Triumph 11’s have been the best shoes for my running so I’m scared to change? Thank you. I also was a faithful Triumph 11 runner and when it was time to purchase new shoes went with what my local running store had in stock – the replacement ISO. I’ve never suffered from such bad blisters as I have running in the ISO – on both feet on the side of the ball of the foot. The Triumph redesign was awful for me, so I purchased 8 pairs of discounted Triumph 11s online to get me through the next 3-4 years of running. Get them while you can. To Saucony: Why did you fundamentally redesign the Triumph instead of simply launching a new upper range model? You have done a disservice to thousands of dedicated, faithful runners who loved their Saucony Triumph 11s. Thank you for your advice! I was hoping someone else was in the same situation. I was thinking of buying a few pairs of the 11’s online & maybe a pair of the ISO to see how they go. I don’t like it when brands redesign their shoe. It often means wasted money & time & having to change to a different brand again. I will wait to see the feedback from the saucony team as well & go from there but can’t go wrong with buying lots of the 11’s when you know they are the shoe for you. I’m having the same problem! My feet are looking disgusting. I have blister on top of blister because I have to keep running. This week I have a blood blister on the right foot, inside and a normal blister on the left. I’ve been loyal to the Saucony brand since 2007 and this is a first for me. Super light shoe, but I think the ISOFIT plastic piece must be rubbing on my inside soles? I’ve tried at least eight different types of running socks, Body Glide, band-aids, etc. I took one week off of running to let the blisters heal up, but they are still coming! Heading to Frontrunners this weekend to look for a new pair of runners. We don’t have answer for that question – since we did not test the 11 – but it seems that Michael has provided some great insights below! What shoes are you wearing currently, and more importantly, does it fit well and ride comfortably? That is a good way to buy a new shoe – see what you’re presently ok with, and find something similar. I am using now Adidas Glide Boost 6 as a shoes for training, tempo runs up 3:50/min and HM races for about one year. Until now looked that is o.k. Results also growing up slowly. But last time I start to feel some pain more and more in my ankles and achilles. And I start to think maybe shoes are not correct which I’ve been using. If to check my shoes wearing off, outer sides weared off little bit more, that’s mean I am underpronator a little bit. But Glide Boost 6 are neutral shoes how I now. Maybe that is a problem. I used also Adios Boost 2 for some tempo runs and one HM, but I’m feeling not so good due to less amortisation. And I cannot say that speed is differ from Glide Boost 6. Could you suggest some very good alternative shoes with small underpronation which can be used for daily, tempo and HM runs. Maybe Saucony ISO Triumph is that what I need.. The Triumph iSO might work for daily runs, but isn’t great for tempo workouts. You’re better off with shoes such as the Nike Lunar Tempo, adidas Boston 5 Boost, New Balance Fresh Foam Zante and the 1500 V1. Thanks a lot! I will try to find and check them. What is the difference between this shoe, the Ride 8, the Guide, and the Glide? Ride 8: Cushioned neutral shoe, Triumph: More cushioned than the Ride. Guide 8: Support/firmer version of the Ride 8. 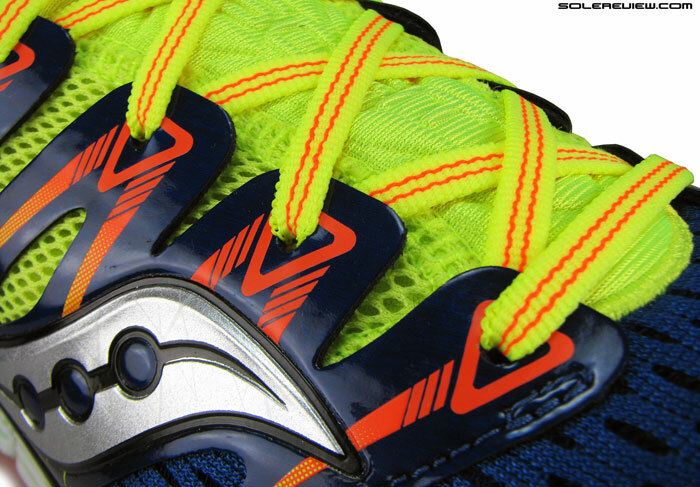 Glide Boost: something like the Ride 8. And please do not post multiple times across the website. All questions will be answered eventually. Which has better cushioning and mileage, the triumph or glycerin 13? Cannot decide between the two. We’d go with the Triumph ISO. The cushioning is more responsive (Glycerin 13 is softer), and the rubber will last longer than that of Brooks. Conor, the Nike Vomero 10 is worth trying. Would have also recommended the Brooks Glycerin 13, except for the fact that its outsole rubber shreds quickly. I just purchased these on sale but have been unable to run in them due to recovering from a subtle stress fracture in my tibia. However, I have tried them on and walked a little. So far these are the most comfortable shoes I have ever worn. I hope they feel the same when I eventually run in them. Both the ISO’s are great shoes, so you should do ok. Recover soon! Hard to say how shoes will behave with injuries, Luis. Recommend a visit to a physio/podiatrist.